Left: Picture posted on the Facebook page of QudsN, after the lethal stabbing attack in Otniel, in which Dafna Meir, 39, the mother of six, was murdered at the entrance to her home, while her children were watching helplessly. The single word in the center of the post reads: “Otniel.” The inscription at the top reads, “Death of a woman settler in a stabbing attack and the retreat of the stabber from the settlement of Otniel, 17/1/2016” – Two days later the killer, Murad Badr Abdallah Idi’s, 16, was apprehended by the Israeli security forces in his village, Bayt Amra, near the town of Yatta in south Mount Hebron, and taken for questioning. FacThe Palestinian leadership is very busy waging political, economic and propaganda warfare against Israel. In Ramallah, the Palestinian Authority is holding official funerals to “heroes” who stabbed to death Israelis, and encouraging others to also become martyrs. In the International arena, the Palestinian Authority is working hard to obtain an Arab League, EU and the UN Security Council resolution that will condemn and declare all Israeli West Bank “settlements” illegal under international law and an obstacle to peace. However, at the same time, Palestinian supporters in Europe and the U.S. are making efforts to delegitimize the Jewish State of Israel. They are successfully lobbying professional groups and universities to ban Israelis. Today, “71 British doctors have submitted a request to the World Medical Association to have the Israel Medical Association expelled. In London’s Kings College, on January 16, 2016, a group of KCL Action Palestine, stormed an event where the former head of the Israeli secret service Shin Bet and commander-in-chief of the navy, Ami Ayalon was speaking. They threw chairs, smashed windows and set off fire alarms. At least 15 MET police officers were needed to evacuate the building. Despite the violence, and damage to property no arrest were made. Apparently, the police considered this a free-speech demonstration. Elsewhere in Europe and the U.S. the Palestinians BDS movement to ban Israelis in Academia and business, as well as Israeli products of Jews from Judea and Samaria and the Golan Hights, is in full swing. Last November the European Union decided to allow such warning labels and supermarket chains throughout Europe stopped carrying Israeli products. In the U.S., the latest to join the BDS movement, was the pension fund for the United Methodist Church, one of the largest Protestant denominations in the United States. It has removed five Israeli banks from its investment portfolio. Left: A sign at the book fair. 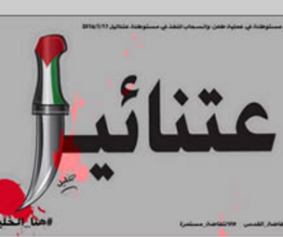 The Arabic reads, “The intifada breaks heads.” Right: A placard with the pictures of two operatives of the Hamas terrorist squad who killed the Henkin couple. is one of the Palestinian terrorists who carried out a terrorist attack on a bus in the Armon Hanatziv neighborhood of Jerusalem. 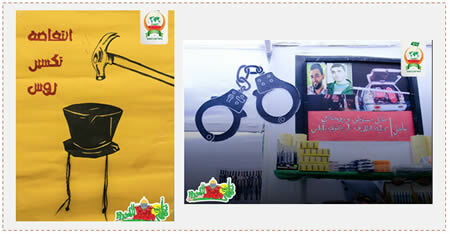 Right: A display glorifying the two terrorists who carried out the attack on a Number 78 bus in Armon Hanatziv in Jerusalem, with their pictures. Hezbollah and Iran affiliated Al-Saberin Movement (“The Al-Saberin Movement for the Victory of Palestine”) is a terrorist network established in 2014 by operatives who left the PIJ. 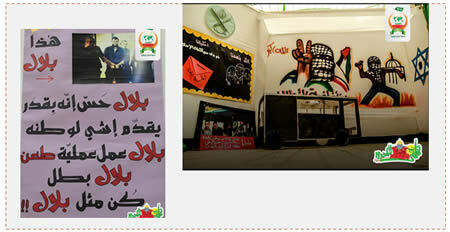 It is affiliated with Hezbollah and Iran, which apparently finances its operations in the Gaza Strip. According to Hashem Salem, head of the Al-Saberin Movement, the organization receives funds from Iran but they are earmarked primarily for da’wah activities…. He refused to comment on whether the organization also received military support from Iran, but did say that its operatives did not receive salaries. As for relations with Hamas, he claimed security and military relations were good and positive, and that Al-Saberin , like the other organizations, was committed to the lull agreement with Israel. As to its relations with the PIJ (most of Al-Saberin’s operatives came from the PIJ) he claimed they were good, but that they had “technical disagreements.”  Regarding other activities of Al-Saberin, he claimed it operated in Judea, Samaria and Jerusalem. It had, he said, a military wing whose objective was to fight Israel and which had actively participated in the recent events (Ma’an News Agency, January 14, 2016). On January 17, 2016, the Al- Saberin Movement issued a statement congratulating Iran on the nuclear agreement and the lifting of sanctions (Website of the Al- Saberin Movement, January 17, 2016). On December 16, 2015, it claimed responsibility for attacking an IDF patrol with an IED near the border security fence in the southern Gaza Strip; there were no casualties. It was the first time since Operation Protective Edge in which a large-scale attack against IDF forces along the Gaza Strip border was avoided. 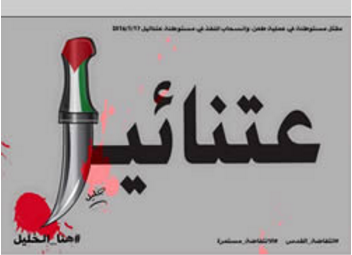 Al-Saberin operatives claimed the attack was part of the “Jerusalem intifada” and a response to Israeli threats against the Gaza Strip (Website of the Al-Saberin Movement, January 18, 2016).